A peaceful spot : sitting, staring and drinking tea. There’s nothing quite like a sheltered place to sit in a garden, not to mention the time to do the staring. Of the two most sittable spots in our garden, one is to be found at the top of the slope in the front garden, tucked away under a towering Scots pine that borders the lane. Until 2012, we’d spent our precious leisure time perching mugs of tea on the wide arms of a wooden bench. In redesigning the front garden one priority was to create a level seating area that was both comfortable to use and good to look at when not in use. It was a quite a challenge …. Not least because we enjoy sharing it with our furry friends. They like to chill out on the sofa too … That is, when they’re not digging a hole under it. They do make us laugh! We used log roll for edging and full length sleepers for wide steps. (I think log roll can be a useful solution, especially for curved beds. Used on this scale – to redress a 2′ drop – ground pegs and cross members are required to keep it in place. Lawn grass is quick to grow through the gaps, so it’s also backed with membrane.) 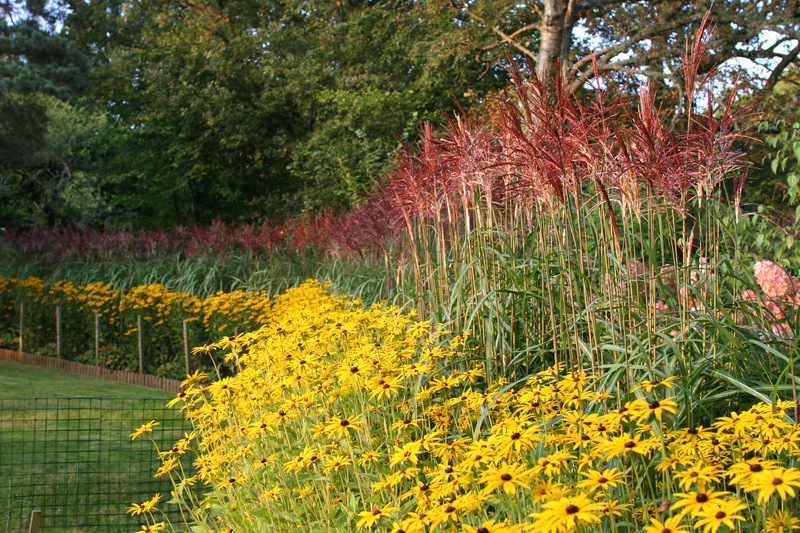 A 3′ wide low hedge of dwarf Miscanthus sinensis ‘Starlight’ softens the landscaping, this is one of many new cultivars available. M.’Starlight’ was introduced in 2012 by Knoll Gardens and it’s a simply stunning plant. The fact that it has flowered freely even on the side where shade is cast by the ancient apple tree is impressive for a species that prefers sunny open sites. The planting provides a decorative screen at just the right height to make the area feel cosy. In July the see-through flowering stems of Molinia ‘Windspiel’ entertain us, dancing as they do in the slightest breeze. 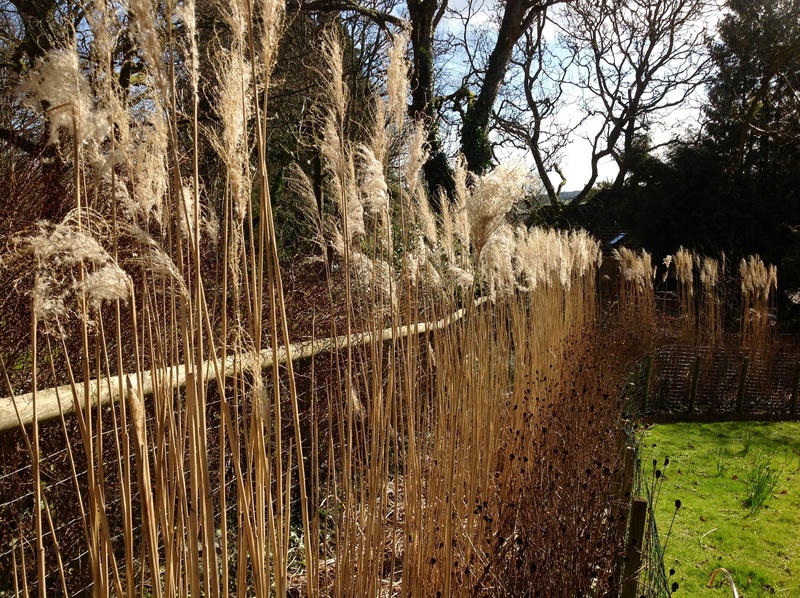 Miscanthus can be trusted to stand beautifully upright throughout the winter months, so much so that it seems a shame to cut it down in early spring. Molinia being a softer leaved grass all but melts away by December, all that’s required is a quick tidy up of fallen flower stems. The west facing seating area is the best spot to enjoy watching the interplay of light and shadow across the garden. The scene is atmospheric in the early morning when the sun angles over the house and shrubby planting on the far side of the drive. The void of mowed grass is restful in itself, especially in a garden that is otherwise so intensively planted. Not having too many distractions enables us to sit back and enjoy the view. 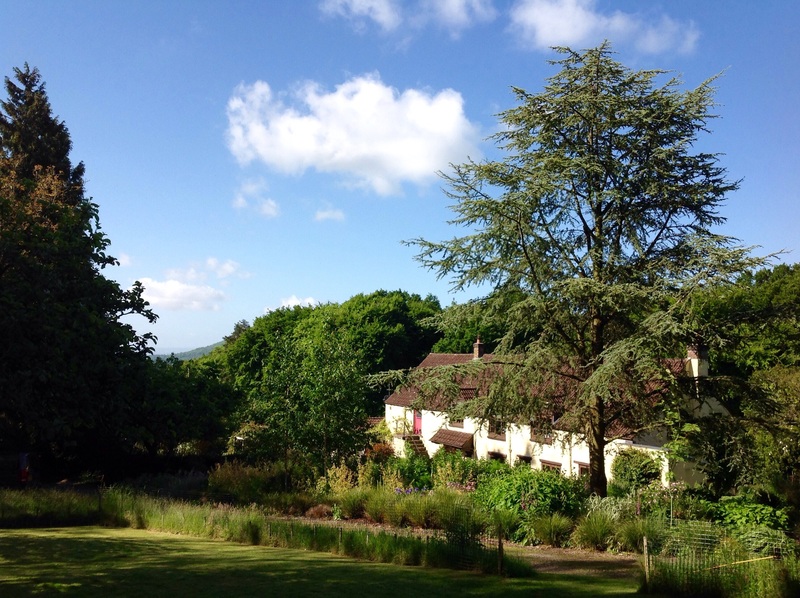 This is the only place in the garden with a view of the sun slipping below the wooded valley. 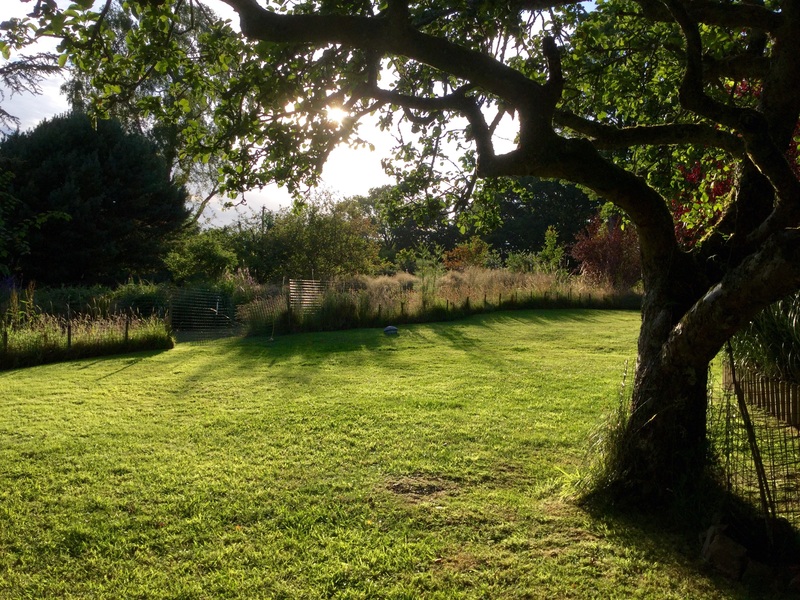 Last autumn a row of overgrown leyllandii were deleted from the far boundary, as a result we now enjoy an extra couple of hours of lingering evening light. The secluded seating area sits centre point to one side of the drive. 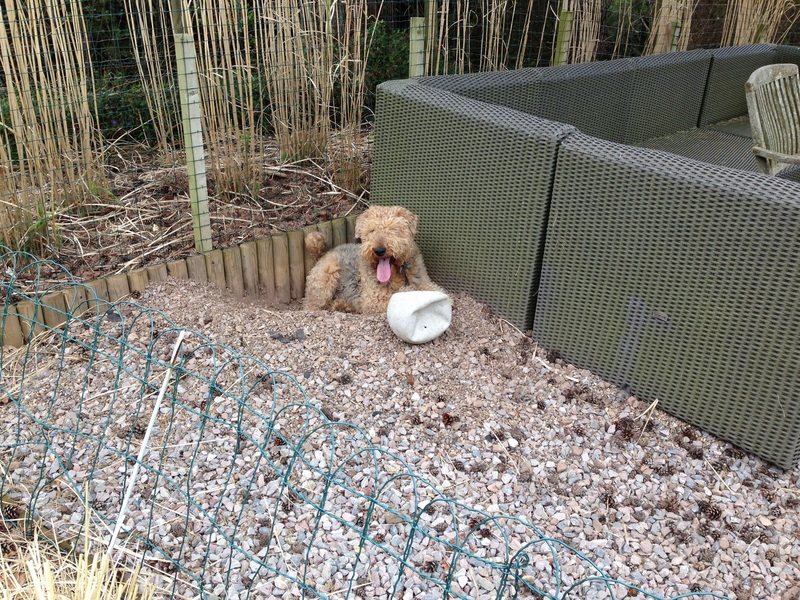 We laughingly refer to the lawn as ‘The Dogs’ Paddock’, designed as it was in 2011 to provide two fun-loving Airedale Terriers with a spacious dog run. In the foreground rough grass skirts the compound concealing the perimeter fence. On close examination this is an admixture of ‘wild grasses and flowers’. Among the highly desirable orchids there’s less desirable weeds : creeping buttercup, dandelion, and cooch grass being most potentially bothersome. This year it’s mown twice, once in mid summer when the daffodils are spent, then again in September, although I’m told that at least once every three years it’s best to mow it by July 15th to preserve the best of the local flora. 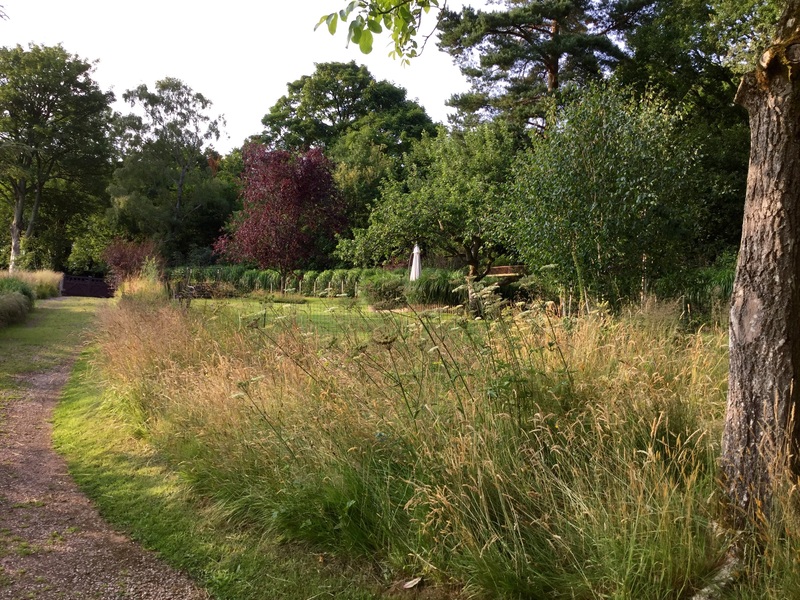 Weeds aside, the unmown strip does a splendid job, in the summer the mesh panels are less visible. 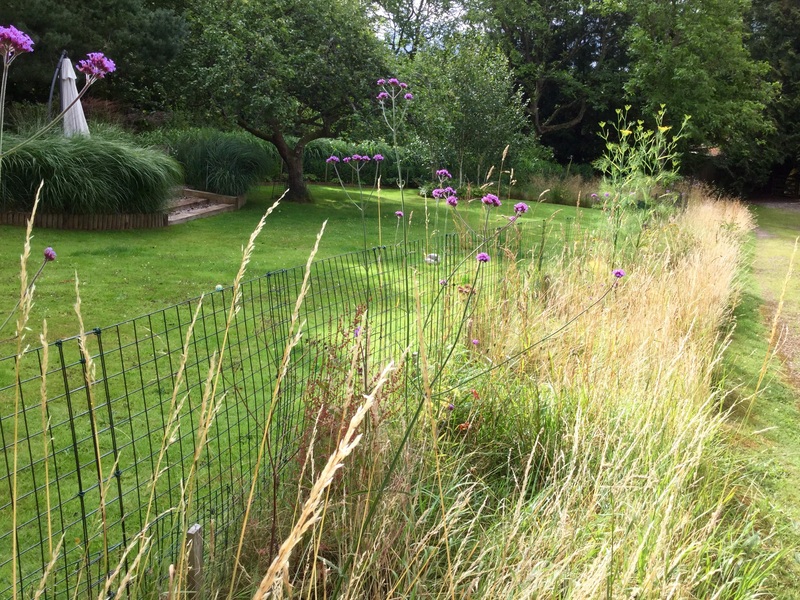 Surprisingly, Verbena bonariensis seems happily at home here, planted as a bit of fun in 2013 at metre intervals most have survived. As predicted, they have seeded … into the drive. Fennel has crept in too, I’m not so sure about its presence here. The slightly higher and more robust fencing parallel to the lane is backed by a 210′ long hedge of stately Miscanthus sinensis ‘Malepartus’. Now in its fourth year, the hedge is gaining stature making handsome 5′ tall hummocks of glossy foliage in July, followed by an eruption of majestic burgundy plumes in August. Behind the hedge is an access path to allow for spring maintenance, it also acts as a weed-break between the border and the stone wall that originally marked the boundary. In rural gardens boundaries may be subject to a host of thugs including brambles, bracken, nettles and hedgerow bindweed – the same is sadly true of less than well-managed native hedgerows. Effectively, the ornamental grass hedge is 5′ back from the stone wall adjacent to the lane and the gap helps us keep it free of pernicious pernennial weeds. In turn, the pared down, low maintenance planting lets us unwind and gather our thoughts rather than gathering handfuls of weeds. From November the hedge assumes it’s dignified winter silhouette. 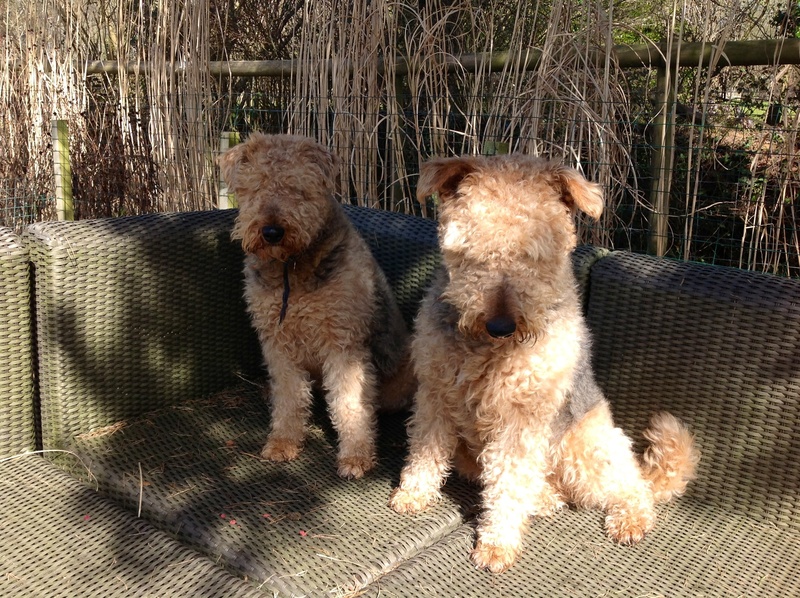 By March both dogs and hedge wait patiently for a hair cut. To me it’s wonderful that we’ve ended up with this tranquil seating area. Without Hitesh’s graph paper skills, a timely nudge towards rough grass from a friendly expert, and the delightful digging dogs this area wouldn’t have come together like this at all. Perhaps daydreaming over spilt cups of tea while nattering with my sister, Woo, on the old bench helped a little bit too. As a final touch, Hitesh made a lovely rustic table out of a giant slice of the sister pine that was felled in the autumn of 2012. It’s level. Bliss! I love the way you’ve used grasses to form hedges, especially the dwarf one which I’d not come across before. You’ve got me thinking now about where I could do the same here, it really does work well in a rural situation. 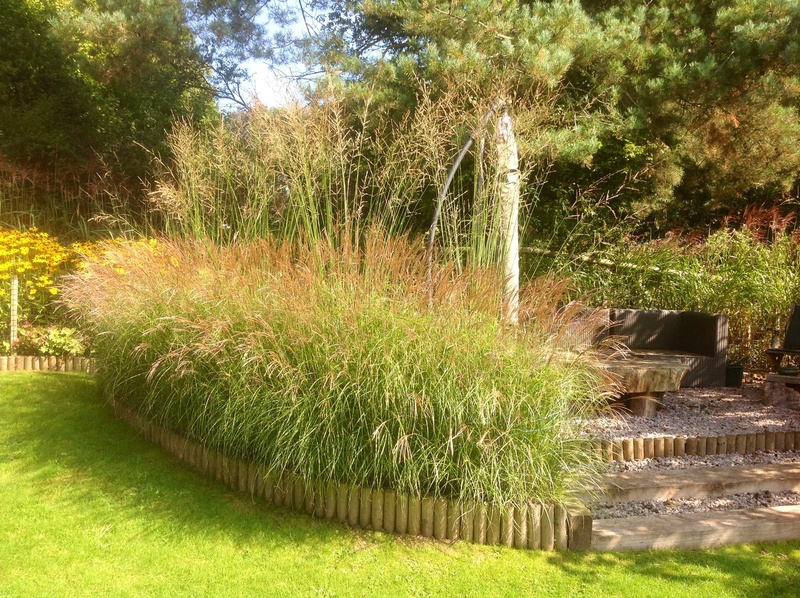 I’m so pleased that you like the dwarf Miscanthus, it’s one of my favourites. There are lots of excellent modern cultivars available, with slightly different habits, the traditional one to is M.’Adagio’, I believe most if not all are derived from the ‘Yakushima Dwarf’ group – perhaps this is useful to know if you do go window shopping for them …. I’m sure they’d fit right in to your beautiful country garden :). Love your table and the miscanthus hedges, they’re fantastic!Miscanthus malepartus is a super plant, I have just one and it is now a wonderful fountain of green, the flowers are such a gorgeous purple and then when it all changes colour it becomes a yellow fountain in the autumn, all from just one plant, amazing! Thank you, Pauline! Isn’t it an incredible plant? How does it behave in the winter? Eventually Kate, about Jan/ Feb, it begins to look a bit messy, when I can’t stand it any longer, it gets chopped down! I have found that by tying it up with string first, makes it much easier to cut and then there aren’t bits everywhere that need tidying. Kate, you have a beautiful garden. And beautiful pets too. That’s so kind of you, thank you Cynthia. 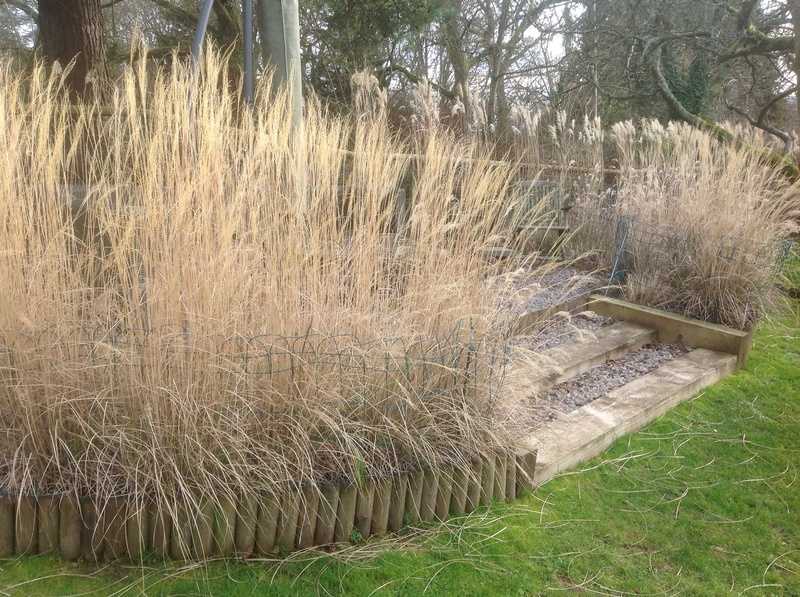 I love your Miscanthus hedged, they are my favourite grass of them all. I laughed a little at your dwarf variety which is taller than my supposedly tall varieties, but they do grow better when they have adequate water. 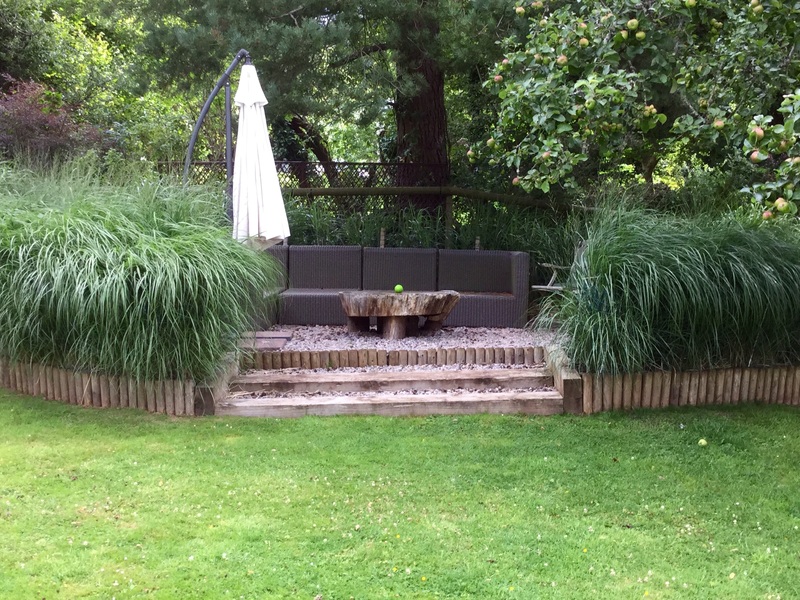 Your comfortable seating is just what a garden should be about – enjoyment. I guess ‘dwarf’ is a relative term! But, they are a third of the height (and less) than some of the tallest cultivars I grow. It’s always possible to bonsai them in a pot;). And, thank you, for spotting the key point that a garden is all about finding a way to enjoy the space …whatever the variables. Some of mine should be very tall but conditions are everything! Yours are obviously in the perfect environment as they all look fabulous. Your arid conditions may be challenging to miscanthus, but I have never seen seen such a floriferous display of Pennisetum villosum as you enjoy in your amazing garden in the Hesperides. Thanks, Karen. You know we love the dogs as much as the garden! What a great place to watch the sun slip away. The sun sets behind houses here, so we never see it happen. I’ve not had much success with Molina. We are too dry in the summer and then too wet with the clay in the winter I think. It does make a lovely haze around your perfectly private sitting area. Nice dogs too! Thanks you for the very kind comment – I shall give the dogs a pat. ‘Haze’ is such an apt way to describe Molinia too – it’s such a shame you’ve had less luck with them so far. Will you try again? Hi Kate, you live in a beautiful spot and I like what you’ve done with your garden. The grasses look fab and yes, I’d like to chill out on these comfy chairs with your dogs :) I’ll pop over to your secluded valley from time to time, happy summer days! Thank you, Annette, both for the lovely comment and for following the barn house garden blog. 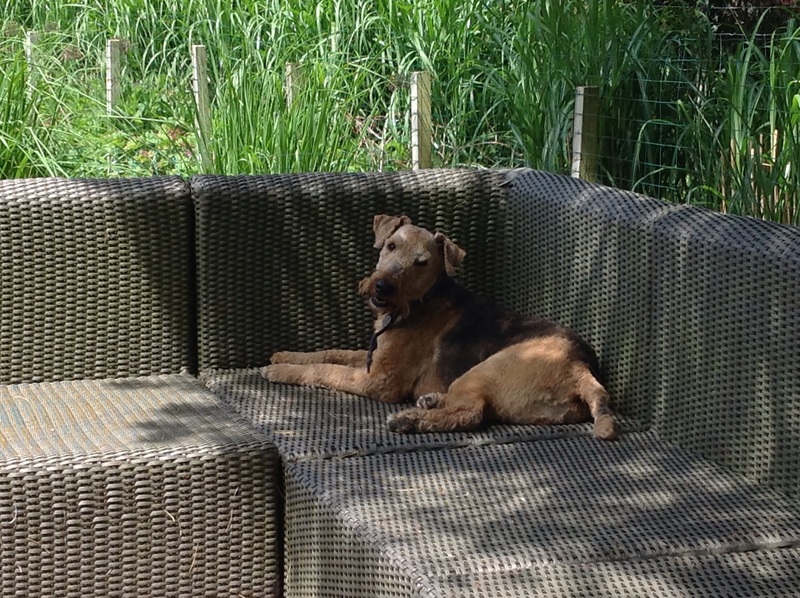 The dogs just love sharing their sofa with nice visitors! Enjoy your summer too. 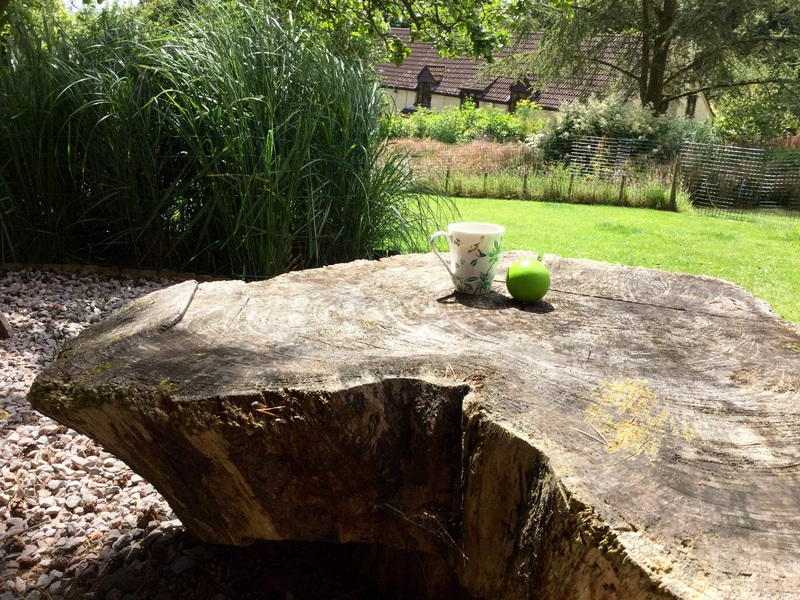 You said it: ‘A peaceful spot: sitting, staring and drinking tea…’ And you have those in your garden. May I add that a garden without that kind of spot is not a garden at all! Thank you for the photos and text! I’m flattered by your remark, especially as I’ve only just found your extraordinary and thought provoking website. I look forward to following it! And, as an ultra busy gardener, managing a modest acre plot, I agree that it’s imperative to build in spots to enjoy the fruits of your labour.